The words PUNCH OUT caught my eye when I was walking in the neighborhood. While I would like to punch out the litterer, I picked up the recyclable cardboard circle and brought it home to recycle. 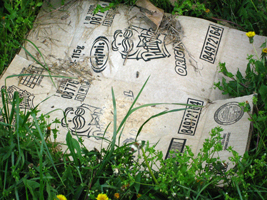 I would like manufacturers to be more proactive about recycling. Tell the consumer to PUNCH OUT AND RECYCLE. 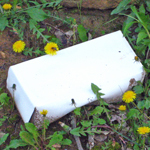 Cardboard boxes are one of the most common items I see in neighbors’ trash weekly. And it is recyclable. As a child, I remember building forts and houses with cardboard. My nephew and his father once built a huge fort with discarded cardboard. While I take my cardboard to the recycling center, I have used it on occasion for dog and cat beds. Although it is not permanent, the cats love to curl up in their beds in a cardboard box. A quick Google search for cardboard reveals furniture, boats, robots and other items constructed from cardboard. 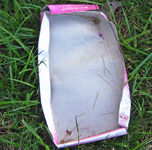 As I was out walking, I found the top of a shoebox tossed in the grass. About 25 feet away, I found the bottom of the shoebox. How lazy! It’s recycleable cardboard. 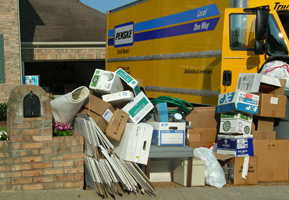 I’ve complained many times in this blog about garbage pick up day in my subdivision because of the number of items I see piled by my neighbors’ trash cans that could have been recycled. This morning after my run, I walked by five houses on my street. Four of which had cardboard items sitting by the trash cans. One person had a lawn mower perched on top of some cardboard. You can probably guess whose house didn’t have any cardboard by the trash can! Tonight when I was walking the dog, I wasn’t surprised to see this Pringles box on the side of the street of the most expensive homes in my neighborhood.